The Industrial Food Chain or the Peasant Food Webs? The Food Systems We Don’t Know We Don’t Know – Fifty years ago, at the first World Food Congress in June 1963, the UN was told that, “We have the means, we have the capacity, to wipe hunger and poverty from the face of the earth in our lifetime – we need only the will.” These words have been the mantra of every food conference since. Yet governments still face major gaps in their knowledge about our food supply and consumption. This became horribly apparent in 2007 when governments failed to recognize that a global food crisis was at hand. Fifty years after policymakers committed to end hunger they need to sort out why governments don’t have the means, the capacity, or the will to end hunger. We don’t know we don’t know for two related reasons: first, because we have spent half a century immersed in the largely uncontested presumption that the prevailing Western model of food production, processing and consumption (the “Industrial Food Chain” in this poster) is inevitable; virtually everything we think about our food security is based upon this premise; second, we have become dependent upon the limited statistics and interpretations volunteered by agribusiness. Even as we are told that “agribusiness as usual” is unstoppable, less and less information about the reality of markets and market share is made public. ETC Group began tracking agribusiness markets in the late 1970s. Over the decades, individual companies and industry analysts have grown more secretive. This is, in part, because the number of analysts is consolidating as rapidly as agribusiness itself. As a result, policymakers accept that increases in meat and dairy consumption, obesity, and the need for fertilizers and pesticides are unchallengeable realities. The demands of “paying customers” are sacrosanct; the demands of the hungry are negotiable. 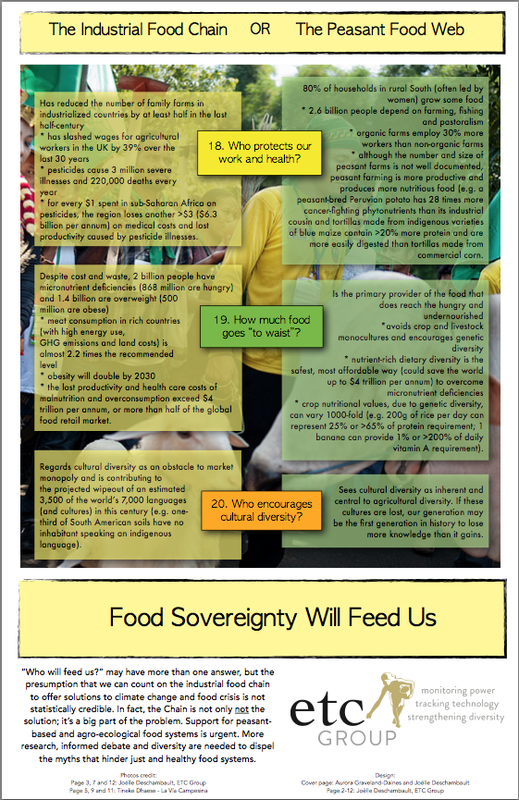 We hope this poster will promote a debate over the conventional wisdom surrounding the Industrial Food Chain. Two Solitudes? So, is everything “black and white”? 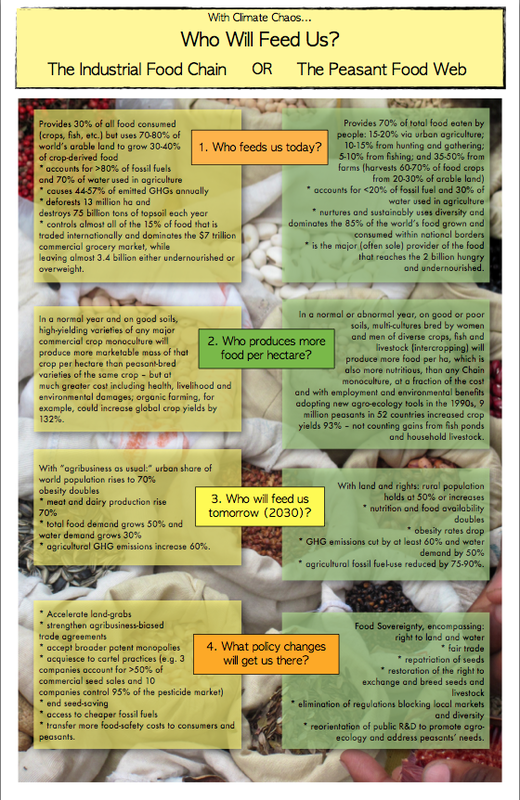 Do policymakers only have a choice between the Industrial Food Chain and the Peasant Food Web? Not necessarily; peasant producers often participate to varying degrees in both systems. But, there is a clear distinction in starting premises: one perspective is that the current Western production paradigm – based on multinational agribusiness – is the only credible starting point. The other perspective is that smallholder producers (i.e., peasants) must be at the center of all local, national and global food policies. This poster unapologetically presents the case for the peasants’ perspective. Peasant Food Web? Many prefer to talk about “farmers” or “smallholder producers” and are concerned that “peasants” is patronizing or pejorative. 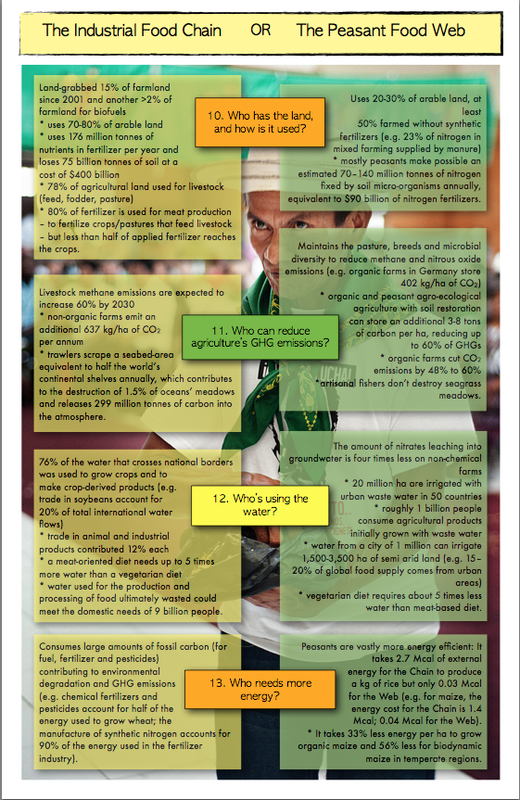 In this poster, we use “peasant” to describe all those who produce food mostly for themselves and their communities whether they are rural, urban, or peri-urban farmers, ocean or freshwater fishers, pastoralists, or hunters and gatherers. Many peasants fit all of these categories. Small farmers often have fishponds and livestock. They often hunt and gather – especially in the sometimes-difficult weeks before harvest. Many peasants move back and forth between city and countryside. When we say “Web” we are talking about the complex of supportive interconnections shared by peasants and communities. Conversely, the “Chain,” although complex, locks in each link and rarely takes into account the “hidden harvest” gathered seasonally from forests, roadsides and savannas. The bounty from urban farming (crops, fish and livestock) is seldom considered. The mix of peasant food sources renders statistical estimates difficult. To complicate things further, peasants grow around 7,000 crops but industrial food chain “bean counters” focus on about 150 crops. The world does not have accurate figures. 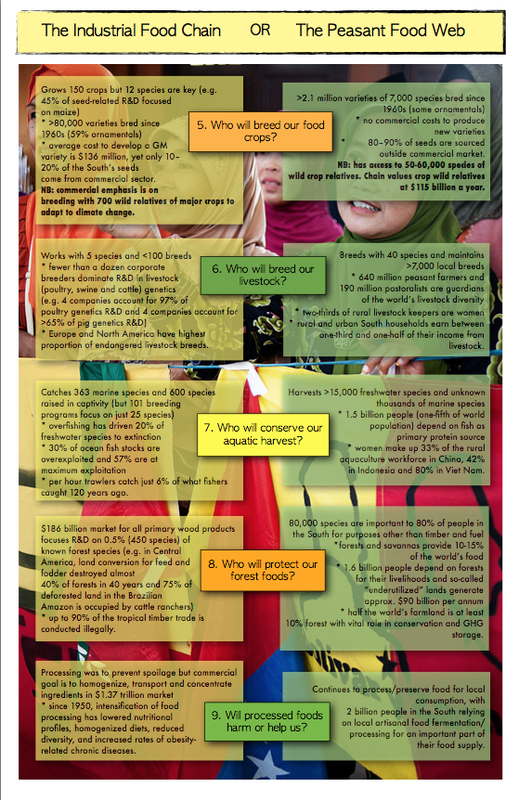 The poster offers our best estimate of the share of the food supply that comes from forests, fish, urban production, etc., but it is only a calculation. We invite others to help with this essential research. The Web works hard not to waste food or the resources to produce food. Where there is “loss” it is almost exclusively due to problems of storage or transportation – not from overconsumption, cosmetic concerns or neglect. 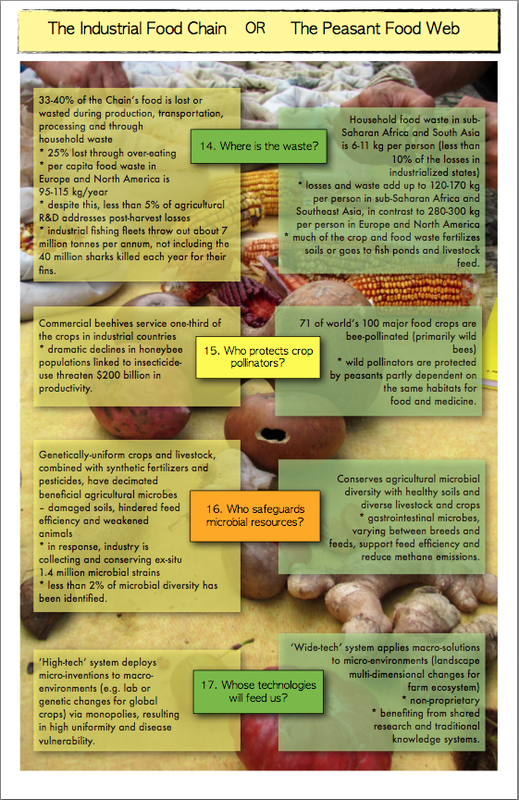 Food that is deteriorating is often rescued for livestock or fertilizer. Would this were true for the Chain! Industrial Food Chain? It is also hard to calculate what food is produced – and how much is consumed – in the Chain. Much has been written about the food waste that comes from discarding cosmetically imperfect fruits and vegetables; from the problems of long-distance transportation; from good quality foods discarded by supermarkets; and the amount that consumers throw away after purchase. Statisticians have spent less time estimating the quantity, health cost, and opportunity cost of overconsumption. The calculation is complicated: how much of the 80% of the world’s agricultural land and fertilizers that goes to animal feed – that turns into meat and dairy products – becomes “waist” as some consumers eat several times the amount recommended by health authorities? The poster attempts to calculate all of these forms of waste and we conclude that the Chain delivers only about 30% of the food that people both eat – and need. The Chain is not capable of reaching those who are hungry and malnourished. Fifty years later, we must recognize that peasants have the capacity and the will to feed the hungry – they need only the means: Food Sovereignty.